Continue on to see the full list of improvements made in this update. 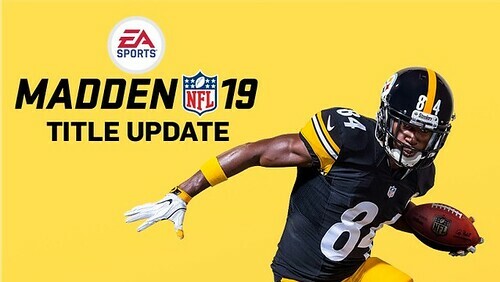 DEV NOTE: This is a similar update to one we did last year, as we made a mistake by not bringing that update over from Madden 18 into Madden 19. While late, we wanted to make sure to give this functionality back our Franchise players this year. DEV NOTE: To address a common piece of feedback from our community about slower players being too successful at chasing down faster players in the open field, we have stretched out the “Player Speed Parity Scale” to increase the discrepancy between players of different speeds. The scale has been expanded to almost double its default value. The goal of this tuning is make a 5-point difference in Speed feel more like a 10-point difference. If you have been playing on the default value already and would like to continue playing on that value, simply reset this value to 75 instead of 50 via the Gameplay Settings menu. However, the new value will be the default setting for online play. Added server functionality that allows the Madden Development team the ability to toggle on/off the Previous Play feature for all MUT modes, without deploying a Title Update. Haven't played this game in well over a month. It's a shame but there is just too much other good stuff to play right now. Guys due to the issue of the friends list inside of the game still only showing select people, I had to remove some guys from my PSN friends list. For some reason it only shows certain people who may not even have Madden, instead of your full PSN friends in the game. I had to remove in order for my opponents in league I am in to show. We play unranked games so have to invite that way.